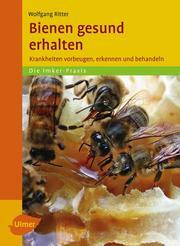 Bienen gesund erhalten (kartoniertes Buch) | Bücher Pavillon Martin Eisenmann e.K. Umfang: 216 S., 10 s/w Fotos, 37 Farbfotos, 62 Zeichng. Preventing, recognising and treating diseases Successful ways to maintain bees' health  Topical: retaining bees as a central environmental factor  Central focus: varroa and its control  Important: healthy bee products The honeybee is the third-most important useful animal; far more important than even honey production is the importance of bees as pollinators of cultivated and wild plants. The health of the bee colony "superorganism" is dependent on environmental and keeping factors. This book describes how beekeepers can look after their bee colonies and prevent and treat diseases - up with the current scientific state of the art, and written in an easy-to-read style. Dr. Wolfgang Ritter ist Biologe, Fachautor, Bioimker und Leiter des Fachbereichs Bienen sowie des internationalen Referenzlabors am CVUA Freiburg/Tierhygiene. Er betreibt Forschungen über Gesundheit und Haltung von Honig-bienen und hat diese in zahlreichen wissenschaftlichen Artikeln veröffentlicht.